Texas' two U.S. senators, John Cornyn and Ted Cruz, on Monday withdrew their support for Roy Moore, the embattled GOP nominee for Senate in Alabama. 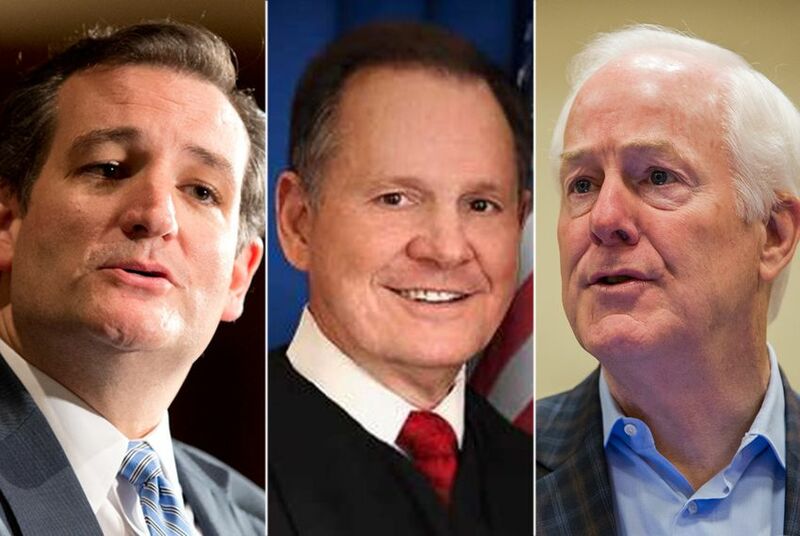 WASHINGTON — Texas' two U.S. senators, John Cornyn and Ted Cruz, on Monday withdrew their support for Roy Moore, the embattled GOP nominee for Senate in Alabama. "I believe the accusations against Roy Moore are disturbing and, if true, disqualifying," Cornyn said Monday, according to Politico. "The most appropriate course of action, in my view, is to leave the final judgment in the hands of Alabama voters — where it has always belonged — and withdraw my endorsement." Last week, The Washington Post reported allegations that Moore pursued sexual or romantic relationships with four teenagers, one of whom was 14. The situation escalated over the weekend, and a fifth woman accused Moore of inappropriate conduct. Cornyn's comment marked another escalation in Senate leadership against Moore's campaign. He is running in a special election to succeed Jeff Sessions, who is now the U.S. attorney general. U.S. Senate Majority Leader Mitch McConnell said earlier on Monday that he believed the previous four accusers and that Moore should "step aside." U.S. Sen. Cory Gardner, the chairman of the Senate Republican campaign arm, called Moore "unfit" to serve in the U.S. Senate and said the chamber should expel him should he win the December race. Their statements came on the same day that a fifth woman accused Moore of making sexual or romantic advances toward her when she was a teenager. U.S. Sen. Ted Cruz, who had also endorsed Moore, had some tough words for the candidate on Monday evening after Senate votes. "One of two things should happen: If these allegations are true, Judge Moore should drop out now. Today," Cruz told reporters. "The people of Alabama deserve to have the option of voting for a strong conservative who has not committed criminal conduct. Or two, if these allegations are not true, then Judge Moore needs to come forward with a strong, persuasive rebuttal demonstrating that they are untrue." When asked if he was pulling his endorsement, Cruz responded: "I am not able to urge the people of Alabama to support his candidacy so long as these allegations remain un-refuted." "Both last week and this week, there are serious charges of criminal conduct that if true, not only make him unfit to serve in the Senate but merit criminal prosecution," he added. "Judge Moore, like any American, is entitled to present a defense. He's entitled to put forth the facts demonstrating that the charges are not true, but as it stands, I can't urge the people of Alabama to support a campaign in the face of these charges without serious, persuasive demonstration that the charges are not true." The political situation has escalated. Base supporters in Alabama are sticking with Moore, as is former Trump White House adviser Steve Bannon, who has pledged back primary opponents for all Republican Senate incumbents, save one: Cruz.